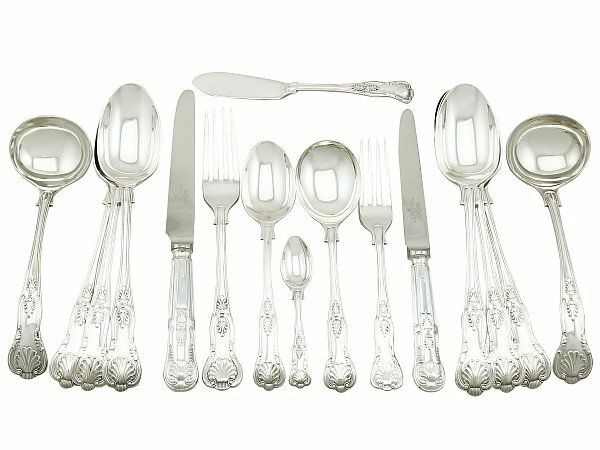 The pieces of this fine, antique George V sterling silver straight* flatware service for twelve persons have been crafted in King's pattern. 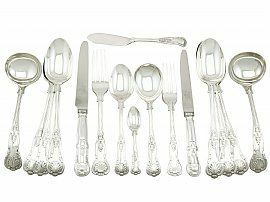 The entire components of this antique service have been crafted by the renowned Birmingham silversmiths Elkington & Co Ltd in 1928, apart from the table and dessert knives, which are replacements**. The replacement sterling silver handled knives were crafted by Mappin & Webb in 1988 and are fitted with stainless steel blades featuring the maker's mark 'Trustworthy, Mappin & Webb, Sheffield'. This antique sterling silver flatware service for 12 is an exceptional gauge of silver, exceptional quality and in exceptional presentation condition. The definition to the Kings pattern is very sharp. Full hallmarks struck to the reverse of each piece and to the surface of the knives are all very clear.